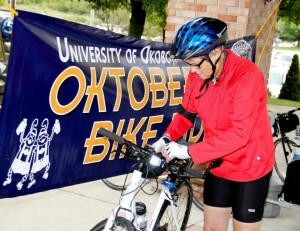 The annual University of Okoboji Oktoberfest was held today, beginning at Arrowwood Resort. Riders geared up for either the 25- or 50- mile rides. The weather was rainy and chilly for bystanders, but everyone was ready for a fun time. It was a great Saturday activity for the Iowa Great Lakes Area!